If your browser is hot and flustered from non-stop rangefinder googling, then stop searching. 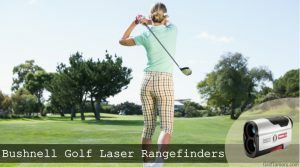 I’m proud to say that if you’re looking for a quality rangefinder from a reputable and American-based brand, then you’ve come to the right site. In this Bushnell golf rangefinder review we are going to check out their best laser rangefinders currently available. You’re dedicated to golf and you’re looking for that new rangefinder that’s intuitive, user-proof, affordable, and accurate. Does this sound like you? Bushnell Golf has all your interests covered when you’re searching for the one unit that’s meant for you. When they’ve been in the sport optics business for as long as they have, you know you can trust their products to deliver exactly what you’re paying for. If anything, it’s not uncommon for Bushnell to deliver on more than you thought you were getting. Whether you’re new to the sport or you’re a longtime professional, Bushnell has a complete line of rangefinders that can cater to all levels of golfers. With their laser speed accuracy, vibrating confirmation features, and handsome design, you know that they’ve been made with one goal in mind: to please the golfer. If you’re ready to experience the satisfaction of owning a Bushnell range finder, be ready to throw your old unit out.